Three Good Things- A Happiness Journal is a simple, yet effective app that will help most people develop a habit of focusing on the positive at least once a day. 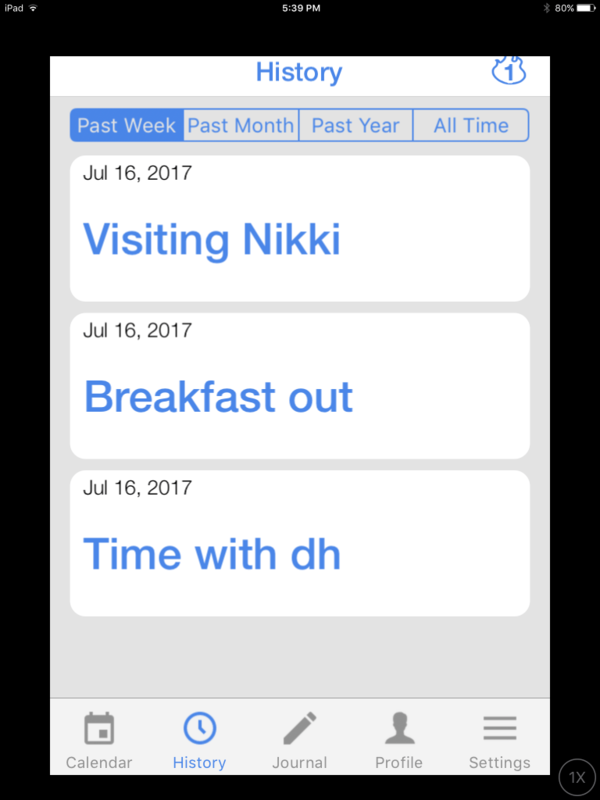 The app includes a notification system and game-like rewards for consistency, making it a bit more interactive than a simple paper and pencil journal. 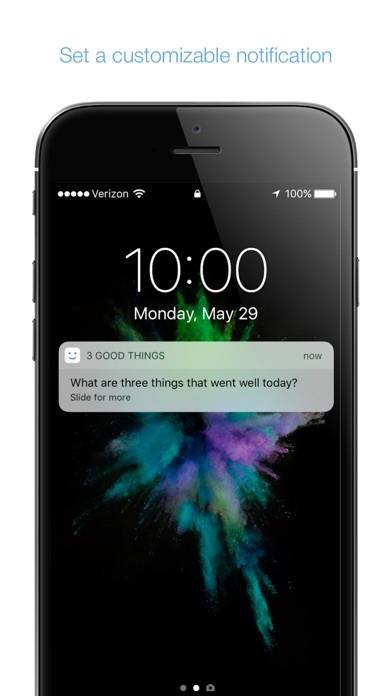 Three Good Things is a journaling app that prompts users to write down three positive sentences each day using notifications and messages. The goal is to build a habit of thinking in a positive manner each day to improve mental health. Three Good Things – A Happiness Journal is a high quality app that performs exactly as expected. The app is simple to use, and so can be used by even younger children who can type simple sentences. It is also very appropriate for older users from children through adults. The interface is very intuitive; it opens to today’s date and has three sections to note happy thoughts. Controls at the bottom of the screen allow access to a calendar, a history tab, a personal profile for use with social media sites, and a settings section that controls notifications and contains ratings, social media connections, feedback tools, and a means to contact the developer. 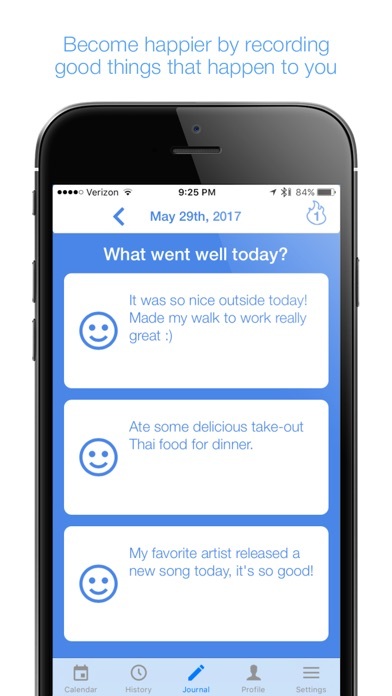 While this app is not truly intended to be educational, numerous psychological studies have shown the benefit of building the habits of positive thoughts. Training the brain to look for positive aspects of life can even lift depression in some cases, and can generally improve a person’s outlook. Much of our thinking patterns are habitual, so making a habit of writing down positive observations can literally rewire the brain. Developers have woven some traditional game-like aspects into Three Good Things. Users can “level up” and earn other recognitions for consistently adding positive notes to the app. The app’s connection to social media can also be a plus for more mature users- it can be very motivating to keep working on a positive habit if one has a support group in the effort. This app is completely free on the App Store, making it an excellent value. Parents of younger users should be cautious, because the app does connect to social media and other sites on the internet, which may not be appropriate for younger users. Three Good Things – A Happiness Journal does not have any outside advertisements, but the app does contain unprotected links to social media, email, the developers’ website, and a ratings system. For this reason, I cannot recommend it for the youngest users who might be able to benefit from it.